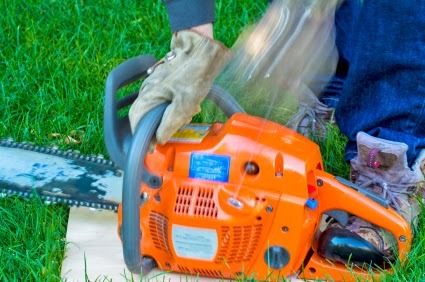 If you've given the pull cord on your chainsaw a few pulls to no avail, you might consider bringing your chainsaw into a service center to get it looked at. Before you jump the gun on getting your chainsaw fixed, however, you should do a simple check of a few components on your chainsaw to determine if you really need to spend the money on a professional. Check gas tank: Obviously if there isn't gas in the tank, your saw won't start, but your gas could also be old. If you haven't stored your chainsaw properly, you will have to get rid of old fuel and refuel your chainsaw. If you have a habit of letting your chainsaw sit for long periods, add Star Tron Enzyme Treatment to your gas so that it won't go bad as quickly. Check spark plugs: An old spark plug is a cheap and easy fix, so you can easily change it without getting a professional involved. Check your chainsaws manual for the type of spark plug you need. There is a good chance it is a Bosch WSR6F. Check air filter: If your air filter is clogged, your engine might not be getting the air it needs to run. Usually you can simply clean your air filter with a brush or compressed air to get it working properly, but if it is damaged you will want to replace it as soon as possible to avoid getting debris in your engine. Clean your chainsaw: You will also want to clean your chainsaw and make sure there isn't any extra debris interfering with starting it. Check out our chainsaw cleaning guide for instructions on how to properly clean your chainsaw. If your saw still won't start, it might be time to bring the saw into a professional that can check out your carburetor, fuel lines, timing and compression and get your saw up and running. HLSupply carries a wide selection of chainsaw parts and supplies for trusted brands including Stihl, Husqvarna, Poulan, Jonsered, and more.